Have you considered podcasting for your business? Are you wondering if now is the right time to start? 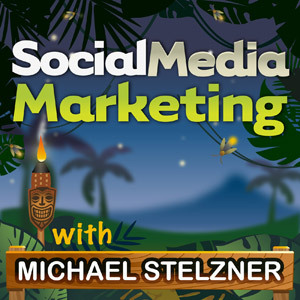 To learn about the amazing growth and the opportunities that exist for marketers, I interview Michael Wolf for this episode of the Social Media Marketing podcast. In this episode, I interview Michael Wolf, who is the host of the NextMarket Podcast. He’s also the chief analyst at NextMarket Insights, where he tracks the growing world of podcasting. Michael’s approach to analyzing podcasting is unique. Michael shares the research he carried out to help him discover more about podcasting, and where the market is headed. You’ll discover why the business category is one of the biggest areas for growth, and the reason why advertisers are now taking notice. Mike is an analyst and loves to dig deep into topics that are normally around technology and media. However, because he’s a big fan of podcasts, he noticed that more people had started to use them, although he didn’t see a corresponding change in attitude from people in the media world. Over the last five years, podcasting has been viewed as a less popular form of media. Even online and new media startups haven’t embraced it. So Mike decided to dig in and find out why. Mike talked to many people including big-name hosts like Adam Carolla, Ira Glass from This American Life and Steven Dubner from Freakonomics. He also had contact with people behind the scenes at organizations such as Libsyn and Microsoft. Listen to the audio clip below to find out what Adam Carolla had to say. Apple has primarily owned the investment side of podcasts with iTunes. The podcast world hasn’t seen great investment in technology, developers or venture capitalists. You’ll find out the kind of momentum Mike has seen when it comes to the investment side of this platform, and what podcasting categories have shown a lot of growth. Listen to the show to find out what the 2013 Social Media Marketing Industry Report revealed about what marketers thought of podcasting. Has podcasting seen any kind of uptick in 2013, and if so, why? Mike explains how the teams at Libsyn and SoundCloud, which host the files, have seen phenomenal growth. Also some of the big-name podcasters have seen traffic reach new records in download numbers every month. All of the signs are from a metrics perspective. When you talk to people about their numbers, there is definitely growth. When you look at the iTunes charts, you’ll notice there are new podcasts launched every day/week across a number of categories. New podcasts show up on a daily and weekly basis in the iTunes charts. Mike says that part of the reason for the growth of this platform is that a lot of people see podcasting as a less crowded channel than blogging. It’s also a form of deeper engagement. You’ll discover what has created the perfect storm for this new growth in listenership, and why new technology built into cars will produce a whole new opportunity. Podcasts are a multitask platform that allows people to give you 20 minutes or so of their time every day or week to listen to you. It’s very intimate and listeners get to know you at a deeper level. The big-name podcasters who already have a huge network behind them to fuel their shows have seen tremendous lift in downloads. This American Life gets around 1 million downloads of each episode. Then there’s Marco Arment, who’s a tech guy and one of the key coders behind Tumblr. His podcast is completely independent of anything associated with the media entity. You’ll find out the kinds of downloads he gets per episode, and where he drives them from. Listen to the show to discover the number of downloads that is seen as a great achievement for independent podcasters. For the NextMarket podcast, Mike interviews everyone including top podcasters, app developers and people behind the big networks. From these interviews, he has noticed that there’s a lot of experimentation around podcast monetization. Mike has heard that if you can get over 10,000 downloads, it’s possible for you to attract interest from some premium advertisers such as Squarespace. It’s the threshold for third-party advertising. You can always advertise your own content. This is seen a lot in the business and solopreneur space. Some people do podcasts to build a platform for their own products. You’ll hear about a new platform called Patreon, which allows fans to become patrons of their favorite content creators and artists. Mike has noticed that podcasters have started to use this platform. Listen to the show to find out why there is a value proposition in a podcast. Mike believes that the business podcast category is one of the biggest areas for growth. Although some podcasts—like Dave Ramsey and Suze Orman—are tied to traditional media, Mike says that he has seen the most growth for the last year or two in the independent category. You can see a lot of traction for solopreneurs and experts in marketing. Mike is excited to see people who are fully independent embrace podcasting. 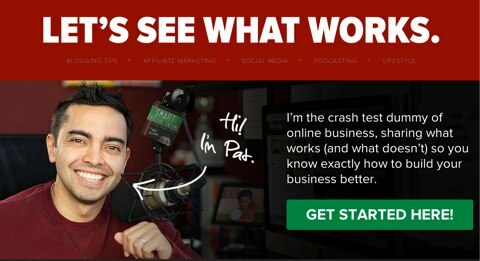 For example, Pat Flynn of the Smart Passive Income Podcast is an evangelist for the platform. This type of podcaster also appears as a guest on other independent podcasters’ shows. Pat Flynn is an evangelist for the podcasting platform. Listen to the show to hear what Mike means by the rat pack effect. Is it too late to start a podcast? Mike believes there are advantages to being an early arriver. Anyone who is first in a category can often build an audience. There is still room in the market for podcasters and lots of opportunity. First of all, you have to make sure the quality of the audio is great, otherwise people will tune out. The next step is to have high-quality content. One way you can test this space is to appear on other people’s shows. It’s a great way to find out if you feel comfortable behind the microphone. There are so many niches that people want to know about. This is where the opportunity lies. Listen to the show to find out why consistency is the key to podcasting success. Are advertisers starting to take notice of podcasting? Mike believes that advertisers are starting to take notice. If you listen to podcasts, you’ll probably hear the names Squarespace, Audible and Citrix. Advertisers have now realized that podcasts are a viable medium with high conversions. You’ll hear why it helps to have the personality who does the podcast read the advertising copy. The metrics are fairly easy to see, as often there’s a coupon code related to the specific podcast. You can see how well it converts. As the market matures from the metrics and advertising infrastructure standpoints, and the conversion is noted, then it will translate into bigger advertisers and agencies becoming involved. When the audience is there, the advertisers will come. You can now see podcast agencies and ad agencies that sell advertising. The aim of Jeff Ullrich’s The Mid Roll and Norm Pattiz’s PodcastOne platforms are to help podcasters connect with advertisers. The way podcasts will be sold will be a big deal. 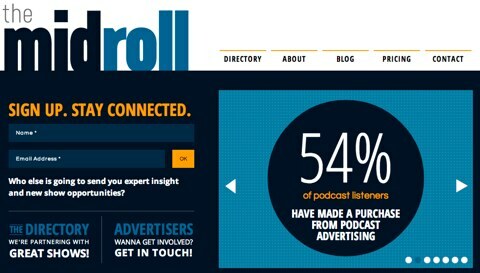 The Mid Roll helps podcasters connect with advertisers. Listen to the show to find out what else is coming that will bring more advertisers in. Mike says that people want to find good talent to bring into their podcast networks. There’s lots of independent voice talent out there who do great work and haven’t been affiliated. You’ll start to see more new podcast listening services and apps from traditional media players. For example, iHeartRadio has a music service and has also launched a talk version. iHeartRadio now has a talk version, as well as music. More established people will come out of the broadcast and radio side to create some spoken-word type of service such as a podcast or app. Mike feels that a lot of new creative voices will appear. Being creative is a huge opportunity. The thing that’s so great about podcasts compared to radio stations is that you have no time constraints. Although you do have to be disciplined about what you do and what you create. You’ll discover why Mike feels that podcasts are at the comeback stage, and will be bigger than ever. So if you’re not into podcasting, then start a podcast. If you are already involved, congratulations and stick with it. Listen to the show to find out how all of these different forms of media are being mixed and matched, and then distributed through all of the various platforms. The content marketing category includes podcasting, video marketing and blogging. Connect with Michael Wolf on his website. Subscribe to the NextMarket podcast on iTunes or SoundCloud. Listen to the Podcast Project, which lists all of Michael’s interviews. Read Michael’s article for Forbes: Funnymen and iPhones: Why the Podcast Is Finally Coming Into its Own. Read more by Michael on Forbes: Making Money With Podcasts No Longer Just About The Ads. Check out Adam Carolla, Ira Glass from This American Life and Steven Dubner from Freakonomics. Learn more about Libsyn and Microsoft, the companies behind the podcasting tools. 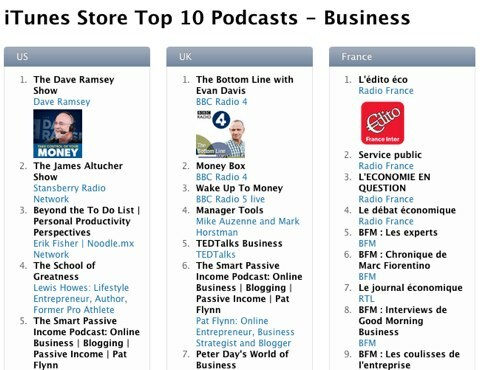 Check out the iTunes podcast chart. Head over to Marco Arment, whose podcast is completely independent. Take a look at Patreon, a new platform that allows fans to become patrons of their favorite content creators and artists. Check out Dave Ramsey and Suze Orman, whose shows are tied to traditional media. Learn more about Pat Flynn of the Smart Passive Income Podcast and John Lee Dumas at Entrepreneur on Fire. Head over to Squarespace, Audible and Citrix. Read about The Mid Roll is doing to help podcasters connect with advertisers. 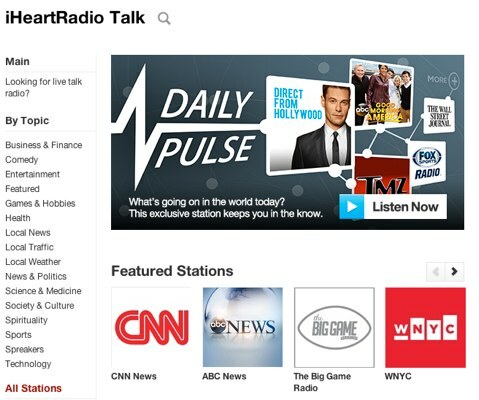 Take a look at iHeartRadio Talk. What do you think? What are your thoughts on podcasting for marketers? Please leave your comments below.